As I recall, it had been a nice September evening some 25 years ago or so, and it was going to be followed by an equally nice morning. Just a few months before this I had finally moved out from my mothers convertible couch in the Bronx and struck out on my own, co-renting an apartment with my best friend Scott, here in Staten Island. It was about 5 in the morning when we headed out to Clove Lake. I wanted to capture pictures of wild flowers with dew on them, and I told Scott a few days before that I was getting up ridiculously early this morning to be there to capture some. Having gotten into photography in no small part due to me and all the pictures I use to bring back, Scott wanted to join me for once to get in on the fun. Now at the time I didn't understand that dew forms over night on plants only if the temperature drops enough from a night of relative high humidity to force the air to release it's excess water on whatever it touches. (The cooler the air gets the less moisture it can hold). I just thought dew formed in some manner on plants early most every morning before I got up, and got burned off by the sun before I was out early enough to see it. This amazingly simplistic theory of mine had me up at 3:30 in the morning trying to beat the sun to a good spot to capture this beautiful nature phenomenon, and Scott trustingly followed me. Fate must have taken pity on me for some reason, because when we got there dew was everywhere! 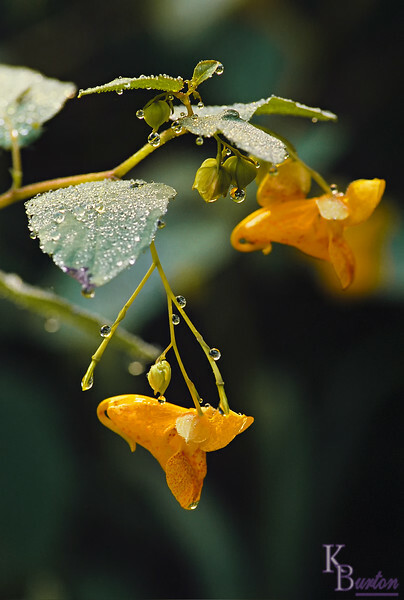 The flower in dominance at Clove Lake that season was jewel weed. Pretty orange with reddish spots I could still make them out in the dim dawn light. After finding an exceptional pair composition wise, in front of a nice solid green background, I set up my equipment and then waited for the sunrise to send a shaft of light to illuminate my prize. Not only did I get this great shot, but after I captured the Jewel weed Scott spotted a white egret hunting in the early morning light and I got my second great nature shot at Clove lake in just one morning. These would turn out to be the first two nature shots of many to come over the years here. Sometimes it's better to be lucky than good! lovely shot, I agree that fate tends to take pity on us. Or that the universe rewards effort, don't know how it happens but some shots just come together. I really like your enthusiasm for his and your willingness to share the story. For instant dew I now carry a spray bottle. I was very lucky with the tulips and dew one morning in Holland.